The Full Super Moon Full Lunar Eclipse arrives at 11 degrees of Leo on Wednesday, January 31 at 8:26 AM EST. A Super Full Moon Eclipse is upon us. It is a time in which to more fully realize the en-light-enment that we each inherently embody. Our recognition of this luminous dimension of the true and authentic self activates the light that we exude to others and to the world. Our personal radiance heals. This embodied light is rising fully within us. This is the second Full Moon of this month. The first full Moon was on January 1rst. Two Full Moons emerging on the first and last days of the first month of the new year bear great significance, providing a heightened opportunity for us to wake up and see what is really there. What is really really there? What have we not yet seen or recognized within our own lives that was standing before our eyes? This once unseen dimension may have existed for eternity. As this is an eclipse, our revelation will be more than one could have ever imagined. Eclipses enhance our emotional awareness. We will discover some facet of our psyche that was hidden in the realm of the subconscious. Our hearts pound with emotion. And yet, we are enlivened by them. They are long lost friends who celebrate their recognition. As they emerge from the darkness, we greet them. Lunar eclipses stir the cauldron of emotion. We are being alchemized. Emotional truth is the concoction of the soul. Revelations which ultimately transform us, may be painful. And yet, the broken heart is an open heart. In the midst of what may seem harsh and unbearable lies Leo’s expansive domain of heart. Our travails through the darkness eventually unravel into an emergence of light. As the shadow of the earth passes across the face of the Moon, we can use the temporary darkness to embrace our own darkness; for soon the Moon’s full spectrum light of the Sun will once again show her radiant glowing face. The Sun and the Moon are cohorts. They emulate the lightness of being. When we are born, we emerge from the womb of the Moon into the light of the Sun. There are times in which the Moon must be revisited in order to go inside and comb through our inner life. Then, we once again return to the Sun. When we allow ourselves to contract, there is expansion. When there is expansion, there is contraction. This is the cycle of life. Leo is a fixed masculine fire sign ruled by the Sun. It’s qualities include charisma, leadership, humor, theatrical style, light-ness, artistic talent, expression, grandeur, royalty, dynamism, flamboyance, ebullience, and courage. 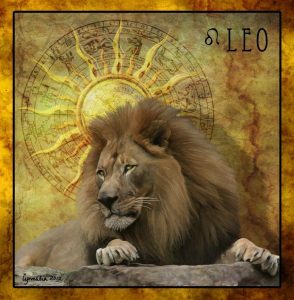 Leo’s dark side tends toward egotism, arrogance, pride, cruelty, and the unwillingness to compromise. As human beings, no matter what our sign, we all fall into darkness during difficult times; or when perhaps we are feeling threatened by something or someone real or imagined. Each and every Sun sign has the capacity for the full embodied light of creative loving expression. 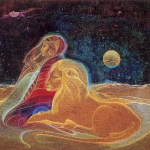 Leo’s essential mission is to mirror to us the magnificence of our own being through the expression of our essential purpose. The relational planet, Venus, is accompanying this lunation. We receive the other’s light while at the same time, exuding our own. The past karma of relational instability has risen to a compassionate realization of our partnership with each other as the facilitators of personal growth and soul-full transformation. We are traveling at the speed of light. May you find yourself shining brightly within your own being. I find this analysis very hopeful. The light of the sun after being eclipsed by the moon has the capacity to bring forth creativity and openness to better relationships. I will keep these thoughts close to my heart. thanks, donna.